Above: St. Issac's Cathedral is one of the world's largest domed churches. 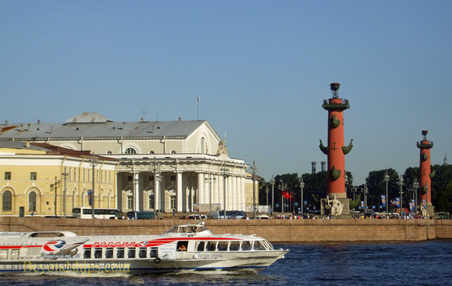 Above: On Vasilevsky Island in the Neva River are many impressive Czarist era buildings including the former Stock Exchange (now the Naval Museum) with the Rostral Columns in front. Below: St. Petersburg has a network of some 60 canals and rivers crossed by some 400 bridges, leading some to call it the "Venice of the North." Above: The Jordan Entrance, at one time the main entrance, to the Winter Palace, which is now the centerpiece of the State Hermitage Museum. 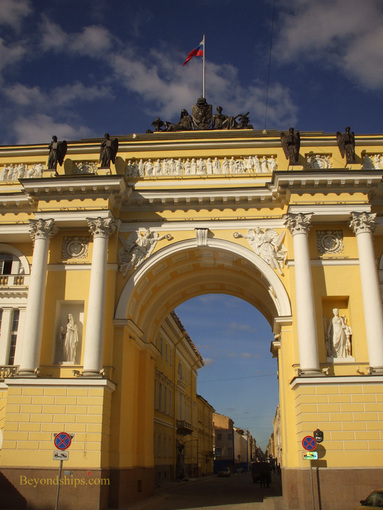 Although St. Petersburg is a relatively young city (founded in 1703), it has a rich history. 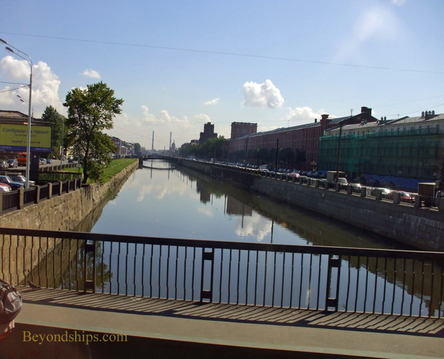 St. Petersburg sprang from the mind of Peter the Great. When Peter was born in 1672, Russia was quite insular with institutions that had not changed since medieval times. Peter became focused on modernizing Russia and bringing her into line with the Western European powers. This ambition became even stronger following his incognito participation in a diplomatic mission that visited the western capitals in 1697. Amongst other things, Peter studied shipbuilding in The Netherlands and city planning in England. He met with artists, architects and scientists and arranged for numerous craftsmen and skilled workman to come to Russia. Peter also saw that in order for Russia to become a great power, she had to become a maritime power. A major problem was, however, that at that time Russia's only major port with access to the oceans was at Archangel and that port could only be used part of the year because of ice. Therefore, he commenced wars against the Ottoman Empire, which controlled access to the oceans from the Black Sea, and against Sweden, which controlled access to the world's oceans through the Baltic. During the war against Sweden, Russia captured the territory where St. Petersburg now stands. Seeing that this place would make a good base for his new navy, Peter built the Fortress of Peter and Paul on Zayachy Island in 1703. He then decided to build a new city around the fortress on the swampy land. This new city would be Russia's “Window on Europe” and to make it suitably grand, Peter brought in craftsmen from Europe. He further decreed that no stone structures could be built anywhere in Russia except St. Petersburg in order to ensure that he had all of Russia's stone masons working on the new city. To help pay for it, he required all Russian nobles to build grand homes in St. Petersburg. He moved the capital from Moscow to St. Petersburg in 1712. Following Peter's death, subsequent czars continued to develop the city. For example, Catherine the Great had the banks of the Neva lined with granite and built additional palaces. By 1861 when serfdom was abolished in Russia, the population of St. Petersburg exceeded that of Moscow and it had become a major industrial city as well as a seaport and center of government. Russia's entry into World War I proved catastrophic, with staggering losses at the front and near-starvation and economic collapse at home. This allowed long simmering civil and military unrest to surface. As a result, industrial protests in St. Petersburg grew into the February Revolution, which forced the Czar to abdicate. A provisional government was formed to replace the Czar. However, it soon became unpopular as it vowed to continue the war and did little to remedy conditions. In addition, the Germans had brought Vladimir Lenin back to Russia from exile in Switzerland in hopes that he would take Russia out of the war. Lenin became the leader of the Bolsheviks and played an instrumental role in stirring up unrest. St. Petersburg was a center of the unrest including a mass demonstration by 50,000 in July 1917. In October the Bolsheviks voted for another revolution. According to Soviet-era histories, the revolt commenced on November 7, 1917 with the firing of a blank shot from the cruiser Aurora, which was (and still is) anchored in the Neva. This was the signal for the revolutionaries led by Lenin to storm the Winter Palace and seize the government. While this incident has been dramatized in several films, modern historians now believe the storming met with no real opposition. In any event, the provisional government fell and the Soviet Union was born. With the revolution, the capital was moved back to Moscow. In 1924, following Lenin's death, St. Petersburg was renamed Leningrad. In the years that followed, Stalinist style apartment buildings were built in the outskirts of the city. For the most part, however, the palaces and governmental buildings of the city center were allowed to remain standing although they were no longer used for their original purposes. The city suffered a 872 day siege by German and Finish forces during World War II. It has been called the “most lethal siege in history” with more than 1.5 million soldiers and civilians killed and 1.4 million forced to evacuate. Supplies could only be brought in over Lake Ladoga by boat in the warmer months and by truck when the lake froze. By order of Adolph Hitler, landmarks that were captured by the Nazis including the Catherine Palace and the Peterhof Palace were looted and severely damaged. Nonetheless, the city never surrendered. With the collapse of the Soviet Union, the city's first democratically-elected mayor took office in 1991. A referendum also decided that the city's name would be changed back to St. Petersburg. 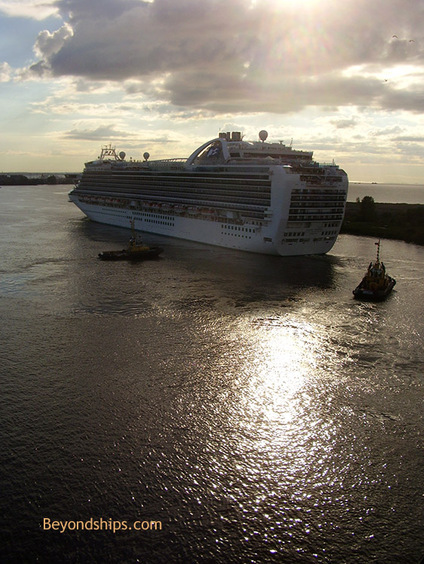 Above: Crown Princess sailing from St. Petersburg. 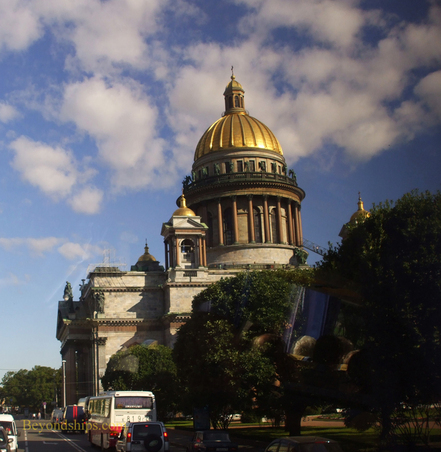 St. Petersburg is a highlight of any Baltic cruise. The historic center of the city boasts an array of pastel-colored Baroque and Neoclassical palaces and public buildings interspersed here and there with traditional Russian-domed churches. World renown art collections, ballet and opera make it a cultural feast. In addition, this is a place where world history has been made time and time again. With a population of over 5 million, St. Petersburg is the second largest city in the Russian Federation. The vast majority of the people are ethnic Russians. Not surprisingly, therefore, most people speak Russian. However, like the architecture of the city center, there is a European influence to the style of the people. St. Petersburg is located on some 60 islands in the mouth of the Neva River. The Neva flows into the Bay of Finland, which adjoins the Baltic Sea. As a result, St. Petersburg is an important commercial seaport. 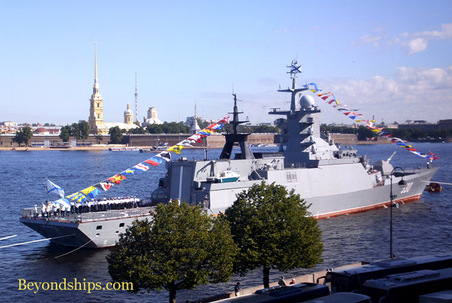 In addition, ships entering or leaving St. Petersburg sail past the traditional home of the Russian Navy's Baltic fleet at Kronstadt on the outskirts of the city. The former capital of Russia lies some 400 miles (600 km) northwest of Moscow. It is on the same latitude as Stockholm, Oslo and Anchorage, Alaska. Consequently, during the summer, daylight extends well into night. This period from June 11 to July 2 is referred to as the “White Nights” by the locals and is a time for festivals and celebrations. However, being so far north, the summers tend to be cool with an average temperature in July of 63 degrees Fahrenheit (17 degrees Celsius). Although St. Petersburg attracts two million foreign tourists a year and an even greater number of Russian tourists, the economy does not rest upon tourism. St. Petersburg is a major manufacturing center hosting automobile plants and shipyards as well as other industries. The industrial plants are located on the outskirts of the city away from the historical center. St, Petersburg has long been a cultural center. It was the city of Dostoyevsky and of Tchaikovsky. The ballet has flourished here with the Mariinsky Opera and Ballet Theater (formerly the Kirov) playing host to such famous dancers as Nureyev and Baryshnikov. 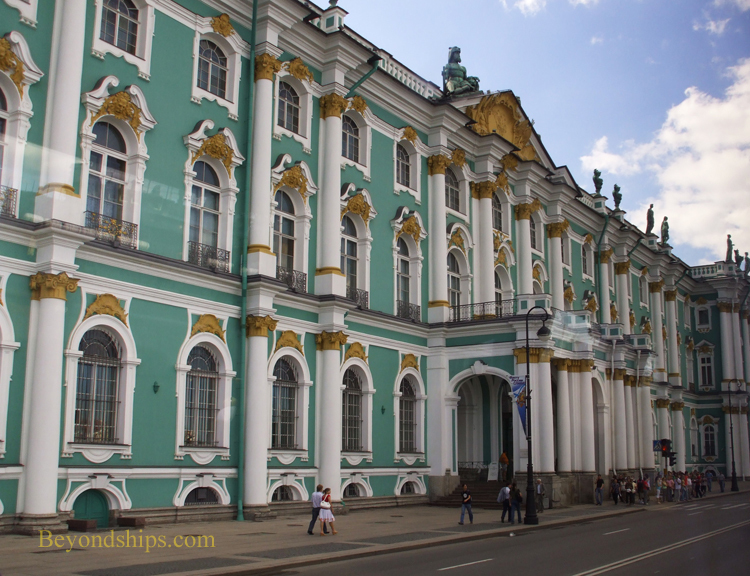 Of course, its museums, most notably The Hermitage, house some of the world's greatest art. The Nevskii Prospekt is regarded as St. Petersburg's main street. Here are found the city's large department stores and fashionable upmarket shops. Although St. Petersburg is a cosmopolitan city, life is different than in cities in the United States and Western Europe. It is advisable to carry your passport and visa (required if touring independently) because random checks by the authorities are not uncommon. Also, officials will check them when you leave or return to your ship. Visitors are also warned to be wary of pickpockets and to be alert for such activity as in any major city. 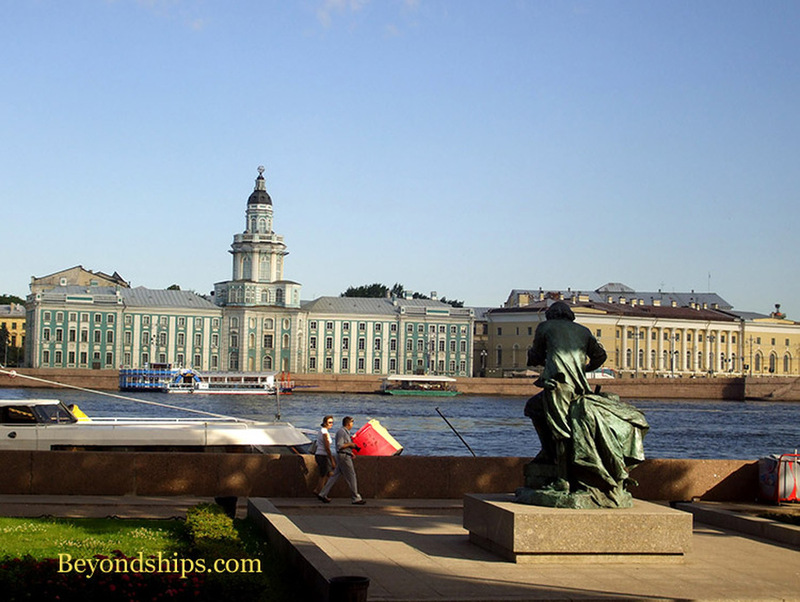 There is so much to see and do in St. Petersburg that cruise ships frequently will stay overnight. This gives you two days and an evening to sample the city's attractions. 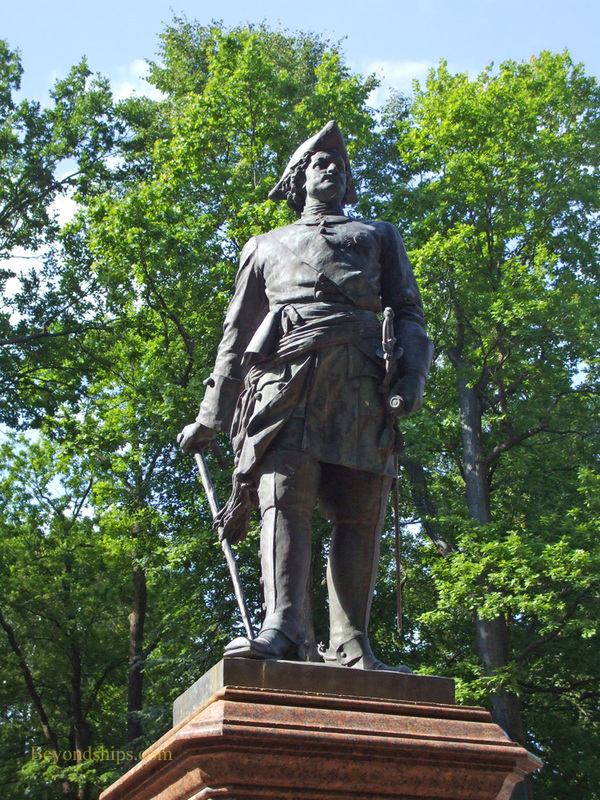 Above: The founder of St. Petersburg, Czar Peter the Great. Above: The Russian Navy frigate Steregushcty in front of the Fortress of Peter and Paul. Below: The arch between the Senate building and the Synod building. Above: A wooden sailing ship moored on the Neva. Until recently, the cruise ship facilities in St. Petersburg were not very good. 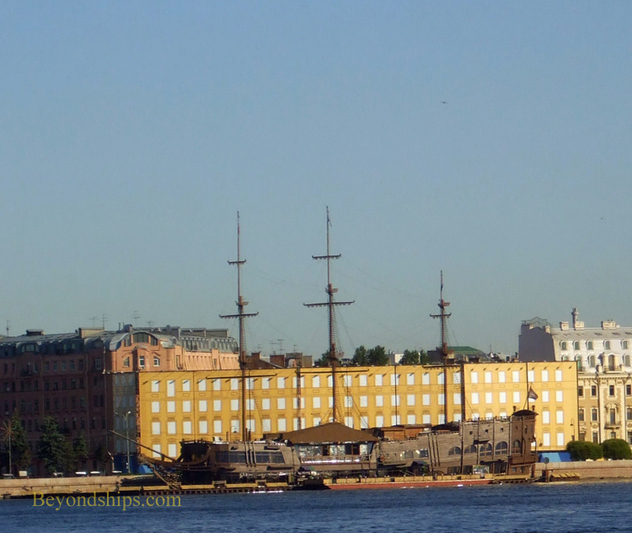 While some smaller cruise ships could dock along the Neva in the heart of the historic area, most ships had to find a berth in the commercial container port. There were no facilities for passengers at the port and the trip into town was quite long. Now, as a result of an investment of some 18 billion rubles ($643 million), St. Petersburg has a new cruise port called the "Morskoy Fasad" (Marine Facade), on the west end of Vasilievsky Island. Built on land reclaimed from the sea, this new facility is part of a larger re-development project that will include businesses, hotels, a convention center and residential buildings. The Marine Facade has three terminal buildings and will have seven berths. Passengers arriving in St. Petersburg cannot simply walk down the gangway and independently explore the city. Unless you are on an organized shore excursion or with a licensed guide, you must obtain a Russian visa prior to arriving. The norm is for the customs officials to thoroughly check each passengers' passport each time the passenger goes ashore or returns to the ship. Below: Looking across the Neva to the Kunstkammer (Museum of Anthropology) and the Zoological Museum.